This In-Stock Table Skirt is Sent Out Immediately When Ordered by 1 p.m. EST! Some Covers Feature Custom Printing for Personalized Events! 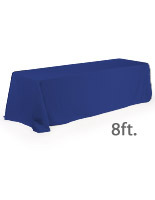 Get a Table Skirt for Banquet Use to Impress Attendees! Bright burgundy cloth is attractive yet durable. Rounded corners for more of a professional appearance. Large table cloth designed to cover all 4 sides of 8' rectangular tables. 100% polyester fabric is machine washable and wrinkle resistant. This throw, table skirt is an inexpensive alternative to renting linens. 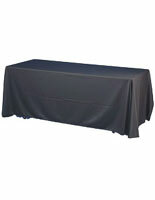 The cover drapes over all four sides, which gives tables a professional appearance. Made from high quality polyester fabric, this table skirt is machine-washable and wrinkle-resistant. 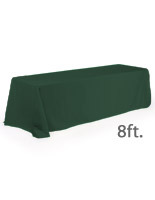 The banquet throw is durable, attractive, and user-friendly, which provides an effective means for displaying merchandise or services. With rounded corners, the polyester table skirt falls within 1" of the floor on each of the four sides. Presenters can also store trade show accessories, boxes, or samples beneath tables when necessary. 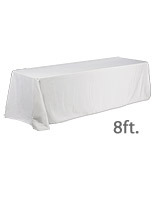 A table skirt, like linen throws and table covers, dresses up any 8' rectangular table in just seconds! The attractive, royal blue color easily complements any environment or setting. A polyester throw can be used during trade shows, banquets, and awards ceremonies. The table skirt is more likely to draw attention than a plain folding table! This linen helps businesses, in particular, develop more uniform and elegant presentations!